It’s that time of year again, year end. SLPs are rushing around trying to get all their work done before the end of the year. For some that is right around the corner and for others, it will be here a little later. Whenever that is, it means that the end of the year business is here. In the US that may mean SLPs are updating IEPs, dealing with last minute referrals, writing reports, and completing all your Medicare billing. For me, it’s finishing up assessments, writing reports, meeting with school boards about children transitioning to their neighborhood schools, and completing big projects that needed to be done yesterday. On top of that, we have significant commitments at home. Talking with colleagues, and reading people’s stories online, it is pretty obvious that we are overwhelmed, overworked, and exhausted. It may sound strange, but it is more important than ever to make sure that we are taking the time to recharge your batteries and strive for some of that “work/life balance” that people talk about and many never seem to achieve. Taking some time for ourselves will make us more efficient at work, more patient with the students, and more effective in therapy. 1. Get out into nature. Getting out of the city or going to the park, is a great way recharge. 2. Go to the spa. Pamper yourself by getting a massage or your nails done. If this is out of your budget, create a “spa” in your home. 3. Go out and eat with friends. An important rule is no shop talk, which can be very challenging if you are getting together with other speechie friends. 4. Read a good book. Find something that would interest you. The only rule is that it cannot be related to work. 5. Try a new hobby. Many friends of mine are now knitting, quilting, painting, cooking and/or gardening. 6. Get out and get some exercise. Find some form exercise that you enjoy doing whether that is yoga, running, lifting weights or taking an exercise class. 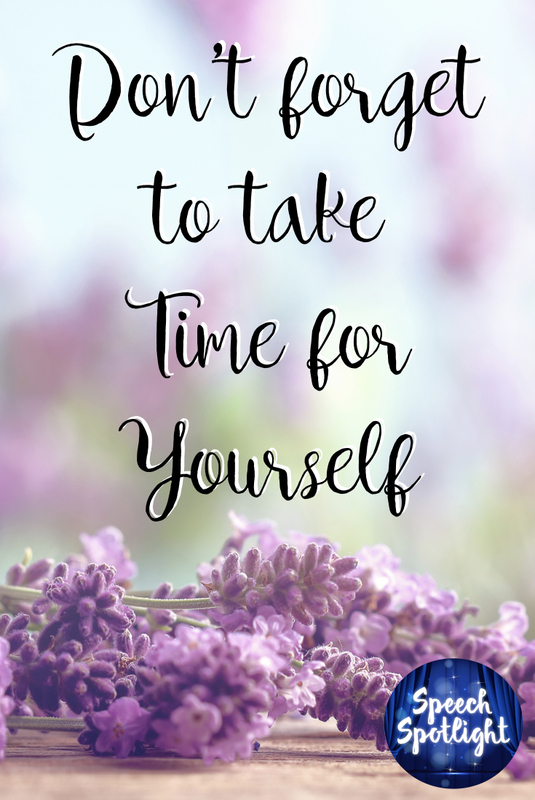 So when the year end is making you crazy with all the work you need to do, remember that is always gets done and that you need to take time for yourself. Great suggestions! I think I need to do all of them!